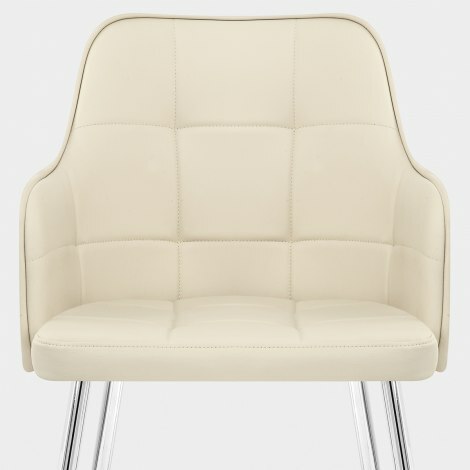 The Dawn Dining Chair Cream is composed of a comfortable, armchair-like design that utilises chic cream faux leather for a contemporary look. Elegant yet efficient, the Dawn has all the components of a fantastic dining chair, and is sure to satisfy. Padded for ultimate comfort, the seat includes a high backrest that effortlessly curves around the body to create supportive armrests and a feeling of secure seating. Stylishly, the seat also features a decorative stitched detail that produces attractive and minimalist square panels within the material. Four stylish chrome legs, including underside protective plugs for use on your surfaces, complete the design and confirm Dawns effortless ability to successfully merge style and convenience. "The Dawn chairs look very stylish and I am delighted"
Dawn chairs are very comfortable and competitively priced. The delivery came as expected and promised.I am very happy with my new dining chairs. This dining chair is being used as a computer desk chair, very comfortable and great looking chair. Great product and great value. Worth a visit to the shop as they have a great range. Customer service was excellent. I'd recommend Atlantic shopping. I actually bought this chair as a bedroom chair for my dressing table and it's ideal. Supportive and comfortable. Slips under the dressing table when not in use and cream colour matches most decor.